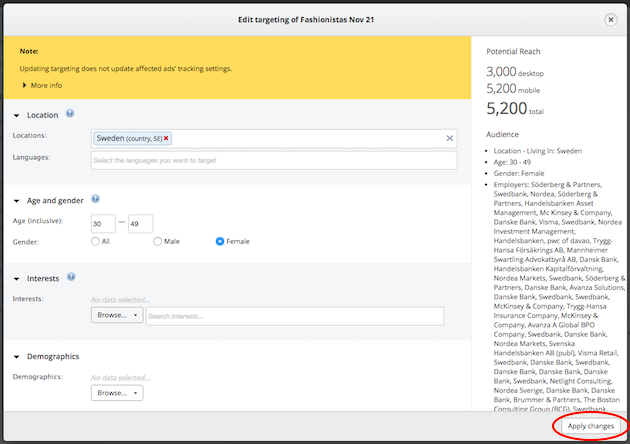 Can I edit targeting on existing ad sets? 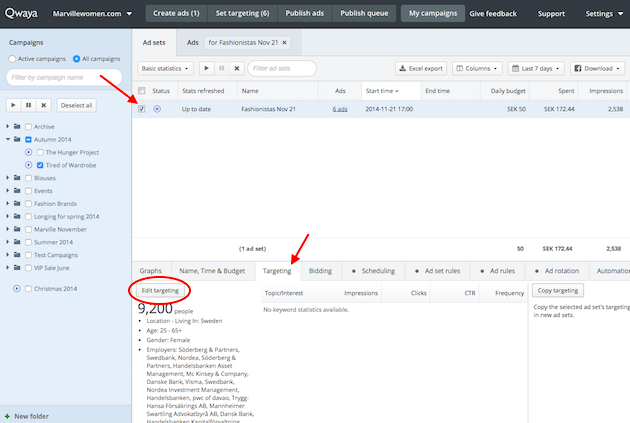 Yes, you can edit the targeting for publish ad sets in the Ad set view in the My Campaigns section. Please note that you can only edit targetings where it’s placed on an ad set level, you will therefore not be able to edit old ad sets where the targeting is set on an ads level. 1. Navigate to My Campaigns and select the Ad set you want to edit the targeting on. Please note that it is not possible to edit multiple different targetings at once. 2. Click on Targeting in the bottom toolbar and select to Edit targeting. 3. Do your changes in the targeting pop-up and click on Apply changes to send the changes to Facebook. Please note that changes in your targeting will not affect the tracking URLs. In the example below I changed the age group and if I have added the age as a parameter for the tracking URLs this will not change to the new age group. 4. You can see the new targeting in the Ad set view.